MgSafe ESRs will be trained along the guidelines of the “European Charter for Researchers”and the “Code of Conduct for the Recruitment of Researchers”1. Following the “T-based skills” concept , MgSafe will stimulate critical knowledge based scientific thinking across traditional academic borders and provide deep understanding of a highly specialised field. In parallel, MgSafe offers the broad overview industry requires from future employees. To demonstrate that the training has a true European dimension, MgSafe will cooperate with the European Society for Biomaterials to award the “The European Biomaterials and Tissue Engineering Doctoral Award (EDA)”2. All training events will be credited according to the “European Credit Transfer and Accumulation System (ECTS)”. Key tool and reference in the structured training is an individual Career Development Plan for each ESR (CDP, template via the Cordis webpage). The CDP will integrate all professional and transferable skill training actions relevant for the ESR. The overall training, CDP management and monitoring at Supervisory Board (SB) level will be conducted as part of WP8. WP7: Leadership in science and industry. The ESRs will achieve an in depth training to become scientific specialists in a specified field (e.g. 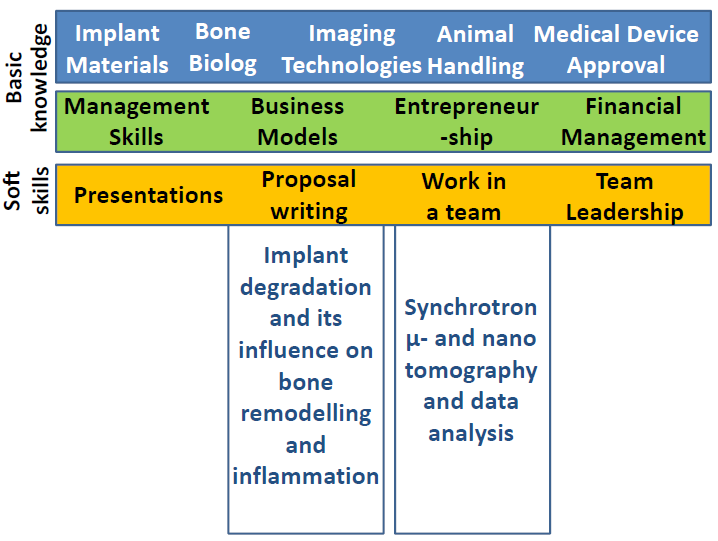 monitoring the implant degradation and bone remodelling via SR-CT, see figure), whereas the horizontal bars indicate broad skills necessary for the ability to collaborate across disciplines with experts of other areas and to apply knowledge in areas of expertise other than one's own3. (1) MgSafe offers ESRs a broad range of subjects and technologies from standard procedures to new emerging techniques (e.g. photoacoustics, which is very rapidly growing in the market). (2) From an innovation point of view, MgSafe will teach an unique methodological fine tuning and intelligent combination of usually independent imaging methods, which is also needed in other areas (e.g. pharma development). This will broaden the scientific skills of the ESRs and enable them to create higher R&I output and to convert ideas into products and services. (3) The ESRs will be exposed to very different elements of the innovation chain (ranging from the needs of surgeons to dealing with regulatory affairs and exploitation of results) and languages, which will widen their individual horizon as well as strengthen their communication skills. (4) They will have access to outstanding facilities and training in the academia sector. This is complemented by private sector participants, which will provide training for the medical device development process and business awareness. It will also facilitate mobility between academia and industry. (5) The secondments to an industrial partner will not only deliver first-hand experience in an industrial environment, but will also develop a very good understanding of what it takes to transform an idea into a product, and of the particular needs of industry, enabling them to speak and understand the‘language’ of industry. (6) Training offered in soft skills, dedicated courses for the specific needs of the individual ESR along with the development of ‘personal learning environments’ will build personalities able to think independently, formulate hypotheses, design and analyse experiments and adopt easily to new environments. Therefore, the ESRs will easily find positions in either industry or academia, both within and outside the network at the end of their training period. (7) The interdisciplinary training in MgSafe spans material science, preclinical research, bioinstrumentation, optics and imaging technologies as well as translatory aspects and regulatory affairs. These young scientists will thus be able to think and work ‘from bench to bedside’ and will be well prepared to tackle the challenges of multidisciplinary research, a necessity for being competitive and innovative in the upcoming years. (8) Being involved in the management of the network (e.g. financial aspects of the network, reporting, exploitation, dissemination) and supported in the application of smaller grands (e.g. RISE) or beam time proposals, the ESRs will have valuable experience for their next career step when leadership positions become possible.